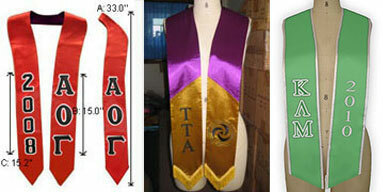 Honor Stoles :: Quality embroidered sashes for honors society members. Honor stoles with custom designed text, symbols or logos skillfully embroidered or printed on to the front are an excellent memento of this special occasion in any graduates life. 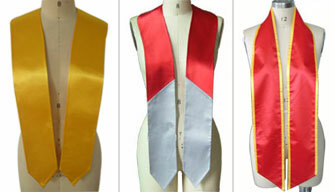 Honor stoles are for the members of honors societies to wear during the commencement ceremony. We are the direct manufacturer of embroidered or printed Honor sashes, so please visit our main page or one of our resellers based in the USA. We manufacture honor stoles from top quality satin fabrics, using state of the art embroidery machines or printing screens. Our experienced seamstress' skillfully produce honor stoles with double lining, which affect a wonderful draping quality that is hard to find amongst the many mass produced honor stoles available in the market. Our honor stoles are built to last a life time.